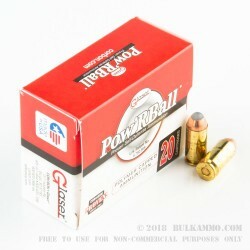 This 40 S&W cartridge by Glaser features a 135 grain Pow’RBall projectile. This bullet has a gilding metal jacket filled with a V-shaped lead core. 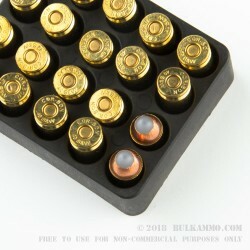 The bullet’s hollow core is capped with a round polymer ball, which is crimped and held in place by the copper jacket. 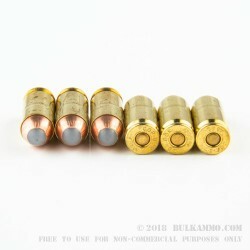 Its bullet’s rounded point helps this cartridge feed reliably in finicky semi-automatic pistols, improves accuracy with its superior aerodynamics, and provides controlled expansion of the projectile when it hits soft tissue. This round’s deep penetration, excellent weight retention, and consistent expansion make it ideal for self-defense. The projectile’s light weight also permits fast follow-up shots with lessened recoil as well. The Glaser line of ammunition is offered by Corbon, a South Dakotan company that emphasizes just how time-tested and reliable their manufacturing processes are. Their meticulous approach means that they do not produce ammunition in fantastic quantities, but what they do put out there is truly excellent.